Planning ahead can make Thanksgiving much less hassle and more laid back for all to enjoy. If you would like to get ahead of the game a bit, making as many things ahead of time as possible is the way to go. 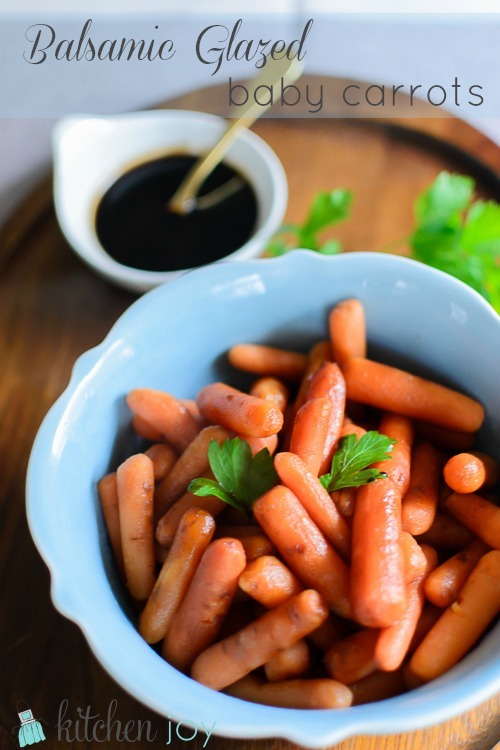 I will be doing a few things ahead of time this year, and preparing my Balsamic Glaze for Balsamic Glazed Baby Carrots is already crossed off my To-Do list. Carrots are a delicious vegetable on their own, don’t get me wrong. They can also be a bit…um…boring. They’re so bright and colorful and pretty on the plate though, and they’re good for you so we’ve got to make them as delicious and appealing as possible, right? Having lived a good part of this year in Italy, Balsamic Glaze has sort of become like ketchup around our house. It makes everything better. Feel free to cook your carrots any way that you like. Boiled, steamed, roasted, etc. Just give them a nice drizzle of warm Balsamic Glaze prior to serving and you’re ready to enjoy them. In a medium saucepan, heat balsamic vinegar and brown sugar over medium-low heat until sugar is dissolved. Simmer, stirring frequently, until liquid has reduced by half (about 20 minutes). Glaze should be thickened slightly and have a syrup-like consistency. (It will thicken a bit more as it cools.) Let glaze cool, then store in a sealed container in the refrigerator until ready to use. 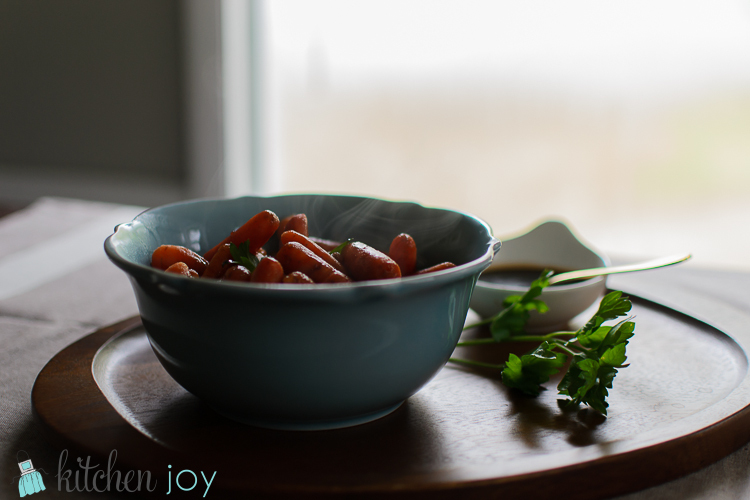 In a medium saucepan, add the carrots, 1 tablespoon of butter, sugar, and salt. Add enough water to cover the carrots. Bring to a boil then lower heat to a simmer. Cook until carrots are tender and water has nearly evaporated, about 8-10 minutes. To serve: Warm 1/2 cup of the Balsamic Glaze in a small saucepan and add remaining 1 tablespoon of butter, stirring until melted and combined. 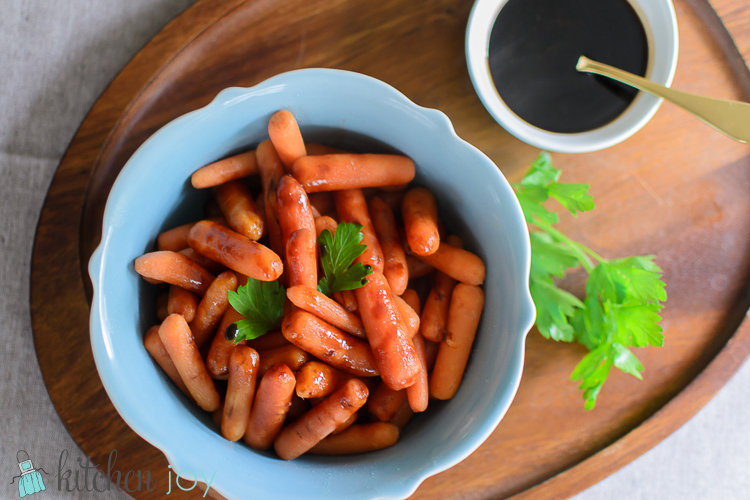 Drizzle glaze over cooked carrots. Serve immediately with additional glaze on the side. Balsamic Glaze can be prepared up to 1 week ahead of time.